Last week I got back from a quick trip to San Francisco. I don’t know if it was the hustle bustle of city life, one to many glasses of wine or a combination of the both but my body was definitely feeling a little polluted by the time I got back home. 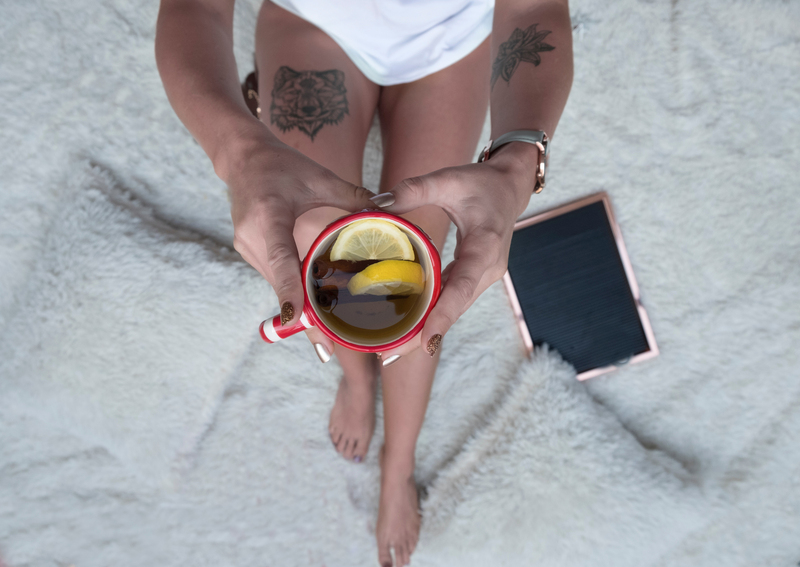 My go-to routine to get back in the swing of things always consists of a good sweat, plenty of water (alkaline preferably), a home-made hotshot (fresh juiced ginger and lemon topped with cayenne) and a little tea time. I’ve always been a tea drinker but it wasn’t until recently that I started paying attention to the health benefits and drinking it habitually. No matter the season, tea can be a tasty bev choice since it can be served hot or cold. At the very least tea is a flavorful way to get your fluids in each day without having to think about it. You’ll be mindlessly reaping benefits like skin clarity, immunity boost, detoxification, and heart health amoung many others. Dandelion root: has inflammatory properties which aids in bloating and water retention. Green: obviously has a ton of antioxident value, great for skin health and brain fog. Alfalfa leaf: a good source of vitamins A, C, E, and K4; and minerals calcium, potassium, phosphorous, and iron. Hibiscus: Hibiscus tea has been known to prevent hypertension, lower blood pressure, keep your liver happy, help with PMS symptoms, depression, aid digestion, weight management and is rich in Vitamin C- it also tastes super good, perfect poured over ice on a summer day! I love spending time in the Sprout’s tea aisle, they have a huge selection. I’ve been gravitating towards to Yogi brand lately because of all the blends they offer and I’m currently obsessed with their detox peach tea flavor, it has zero caffeine and is great for bedtime. I’m slowing creating collection and have been loving all the new finds.